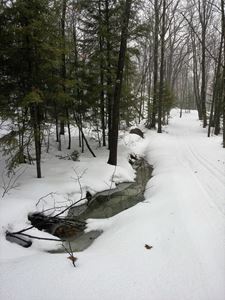 One week after the Nordic trip, ABR's trails looked like this with plenty of fresh snow. Sally demonstrates a snowplow near the bottom of the River Trail hill. 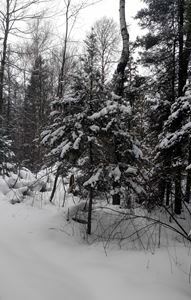 Here the snowshoe trail crosses Hemlock trail. Mild temperatures created moving water along the creek. “Why, of course it matches my shirt!” …Ann at Branding Iron Steakhouse on Jan 21.